In April, I had the pleasure of giving a keynote seminar at the annual general meeting of the Edmonton branch of Advocis, a national certification organization for financial planners. Id like to thank Paul Fawcett and Marian Mocanu for giving me the opportunity to crystallize some investment concepts which I have been mulling over in the past few years. In the next few months Ill be writing a series of articles summarizing the seminar. I define a Superbubble to be a speculative boom involving large amounts of debt whose collapse causes a banking crisis. In the past century there have been three Superbubbles: The Roaring Twenties, a boom based upon stock market speculation which brought about the Great Depression; the Japanese bubble in stocks and real estate in the 1980s which resulted in their Lost Decade and finally the world-wide real estate bubble of the 2000s that gave us the global financial crisis which we are still living through. The two emotions that successful investors must overcome are fear and its polar opposite, overoptimism. By studying the Superbubbles you get a first-hand look at both the giddy heights of speculative euphoria and the depths of investor despair and panic. How markets behaved during these extreme episodes gives you a benchmark for making financial plans that can stand up to the worst economic weather. Although history doesnt repeat itself, it rhymes. There are consistent patterns in all Superbubbles. Why have gold prices soared recently despite low inflation, why are interest rates at record lows and why is the recovery taking so long? History can help with the answers. There are four major Lessons. 2. Lobster Trap Economics: Why post-bubble recoveries take so long. 3. The bottom is not the bottom: The unexpected market behavior in the wake of a bubbles collapse. 4. Out of despair, come profits: The rewards for those who are able to weather the storm. This month we will cover Hemingways Rule. 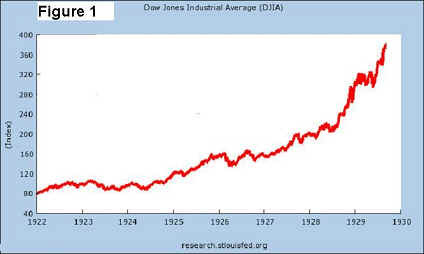 We will start with how it applied during the stock market bubble of the Roaring Twenties. Then well look at how it worked during the initial phases of the global financial crisis of 2008 and finally see what it tells us about the future  in particular, what will happen to a home-grown Canadian bubble in the next year or so. It was a time of incredible optimism. But optimism has a way of getting out of hand. As new businesses sprang up, and profits rose, the stock market began a slow ascent. This did not go unnoticed and soon the common wisdom was that the stock market was the assured road to wealth. There remained only one more lethal leap of faith to guarantee disaster: If stocks would make you rich, then why not hasten the ascension by borrowing money to buy? In those days you could buy stock with only 5% down. (After the Great Depression, they changed the rules. The only thing you can buy nowadays with 5% down is real estate and whod be crazy enough to do that?). From 1927-1929, the amount of money people borrowed to buy stock in the U.S. quadrupled until it was two and half times the size of the annual federal governments budget. The stock market chart tells the story. They didnt call it the Roaring Twenties for nothing. From 1922 to the peak in late 1929, the Dow Jones Industrial Average rose fivefold. Note the steep climb in 1929 as investors bought more and more stocks using margin debt. But rather than a stairway to prosperity, it would turn out to be a ladder that ended in mid-air. The collapse is easy to explain. When the price level rises to a critical point, new buyers are reluctant to make further wagers. As prices start to dip, the throng of unfortunate investors who borrowed to buy shares near the top are forced to sell their positions or come up with more collateral. This pushes prices down further which in turn throws more debtors into trouble. The accelerating decline scares away would-be buyers and what would otherwise be a gentle correction turns into a vicious unraveling. Thus Hemingways Rule: In debt-fuelled bubbles, the decline is much sharper than the rise. When painted in the context of the Great Crash, Hemingways Rule seems obvious. But as we will see, mainstream economists get it wrong even today. Once you know how Hemingways Rule works, you can see it in action in many of the pivotal financial events of the past decade. Remember Lehman Brothers? Here was a well-respected investment company that in a fit of managerial insanity gradually borrowed thirty dollars for every dollar it had on hand. Talk about binging on debt. The sudden end came in 2008, when it lost 94% of its share value before declaring bankruptcy. Hemingways Rule applies to countries as well. Take the Greek financial crisis. When you look at the chart of Greeces growing debt, it was clear that the trajectory was unsustainable as early as 2008. The problem was gradual in its making. Two years later the papers were suddenly filled with headlines about riots in the street and the possible bankruptcy of the government. These are all historical examples of course. Does Hemingways Rule have anything to tell us about the future? It does indeed. And to set the stage lets look at how it applied in the U.S. real estate bubble and then we will see what it predicts in the coming implosion of a bubble thats closer to home. The dynamics of this bubble are exactly the same as the one eighty years earlier. Instead of speculating on stocks, the public, intoxicated by record-low interest rates, seized upon real estate as the guaranteed route to financial nirvana. 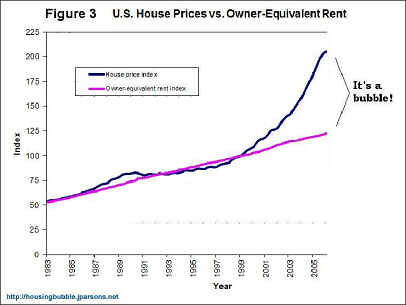 Figure 3 shows clearly why housing in the U.S. in the 2000s was a bubble. 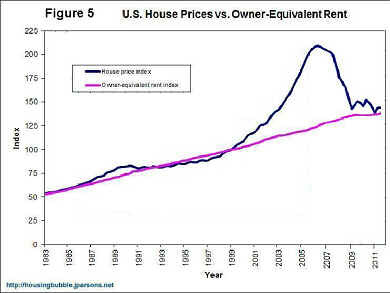 The graph compares the cost of buying a house (dark line) with the cost of renting (light line). In a normal market, the cost of housing should track the cost of renting. If house prices go up, more people should start renting, and this would bring down the cost of houses and increase rents. They should converge. What happened in the mid-2000s is the opposite: House prices skyrocketed but rents remained low, a sure sign that people were not making rational decisions. Not only that, they were using massive leverage, by 2008 U.S. consumers were mortgaged to the tune of US$15 trillion, double the level only seven years earlier. The facts were in plain sight but as in all bubbles, many refused to see. 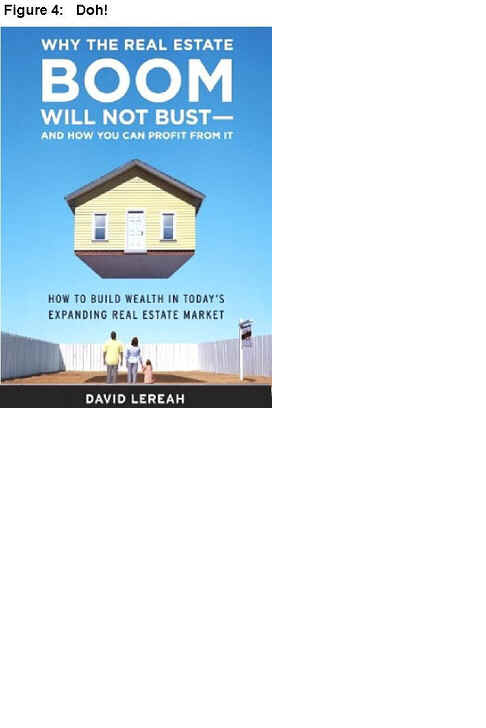 In 2006, David Lereah, Chief Economist at the National Association of Realtors, authored a book pictured in Figure 4. Leaving aside the strange cover (the house is suspended in mid-air, about to fall and crush the awestruck family), Lereah said that though house prices had stormed higher, there would be no crash. Instead there would simply be a gentle landing, a moderation of price increases. When a bubble collapses, it falls with a merciless knife-edge. The crash scythed through neighborhoods from coast to coast. In some Californian suburbs, prices fell by 70%. In Las Vegas, prices fell 65%, in Phoenix and Daytona Beach they dropped 60%. Rather than a gentle landing, five years of price increases were erased in eighteen months. Millions had their homes foreclosed and the tidal wave of defaults threw the banking system into chaos. In Canada we watched it all unfold and we braced ourselves as best we could against the global banking crisis. Four years later, there is widespread feeling that the worst is over. Theres even a note of triumphalism in how well Canada has fared. Too bad it isnt justified. The terrible news is that weve committed the same sin as our southern neighbors. 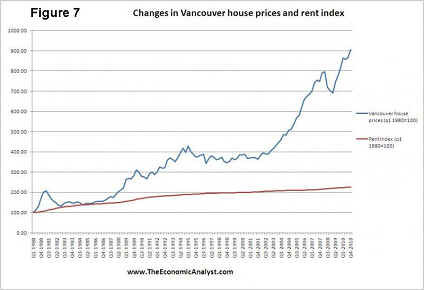 Take a look at the following charts for Toronto and Vancouver (Fig. 6 and 7 courtesy of Ben Rabidoux at theeconomicanalyst.com. Check his website out for some excellent real estate analysis). Do you see how the house price curves have lost touch with the reality of rental prices in both those cities? Do you see how its a portrait of speculative excess, just like the U.S. housing market before it went to heck in a handbasket? Toronto and Vancouver are the two cities most out of whack but all major Canadian cities are overvalued. For prices to return to normal, that is, for them to go back to a normal multiple of rental costs, Vancouver housing prices would have to fall 65-70%; Toronto would fall by 60-65%. Other Canadian cities will suffer sizeable shocks proportional to their overvaluations: Montreal and Ottawa, would see a decline of 50-55%, Edmonton and Calgary 25-30%. There are two common counter-arguments. One is that Canada is different, that the U.S. crisis arose because of subprime lending. That is true to a point, but subprime lending was only the froth on the larger bubble. Surprisingly enough, the majority of American foreclosures are of prime mortgages. We have little reason for complacency, the debt-to-income level of the average Canadian consumer is now worse than what the typical American had at the height of their real estate mania. Many Canadians who put 5-10% down on a house are one slim paycheck away from being subprime. The second counter-argument is HAM: Hot Asian Money. Wont rich Chinese investors keep prices high indefinitely? Although Asian buyers have juiced up property values, their influence is overstated. They wont be able to prevent a collapse and this is a fact. How do we know? Asian investors have not limited their investments to Canadian hotspots. Southern California has been an attractive destination too. Was it enough to prevent the Californian real estate crash? In San Francisco, a city with substantial Asian immigration, house prices have fallen 50% from their peak in 2006. Hemingways rule says the fall in Canadian house values will be swift. 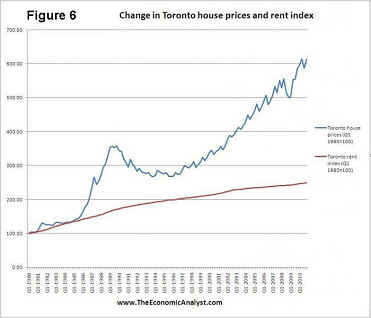 If anything, I think the upcoming crash in Canadian real estate prices will be more rapid than what happened in the U.S. First, there is the stark record of the American fiasco. Once prices begin falling, the parallels will become immediately obvious and there will be sudden alarm. Secondly, every bubble attracts momentum investors, these are the flippers who buy in hopes of selling to a greater fool. In the U.S. distressed investors in many states simply walked away from their properties, leaving banks in the lurch. Here in Canada, walking away is not so easy. If you signed the mortgage papers you are liable for the debt even if a foreclosure happens. How many flippers are going to hang around when the going gets tough? How many want to be saddled with hundreds of thousands of dollars of debt? They will bail at the first sign of a market meltdown. I expect to see a large number of condo projects going bankrupt in most major urban areas. It will not be pretty. Hemingways Rule says shes wrong. Next time: Lessons from the Superbubbles  Part 2: The Lobster Trap Economy Or Why Things Are So Difficult to Fix.